There are usually several ways to get from Point A to Point B. As my readers should know by now, I seldom use the shortest-distance-is-a-straight-line route. Sunday was no exception. Here’s the route I took on Google Maps. I met my buddy, Brutus, at a gas station in Beaverton at 9:30. 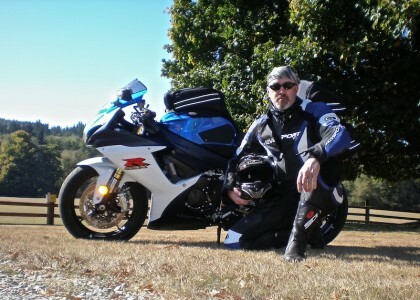 We chatted for a bit and discussed his new bike, a 2008 Kawasaki Ninja 250, as well as his day-glo jacket and pants which has earned him the unofficial nickname, “The Noticeable One.” We then headed west on Highway 26 before cutting southwest onto Highway 6. A few miles later we turned north on Timber Road. The surface is in fantastic shape and the curves are plenty and offer a nice variety. There are a lot of driveways to farms and plenty of woods, so critters and slow locals are to be watched for. We had to stop for a dog and a cat in the roadway less than a half-mile from each other. We soon reached the creepy town of Vernonia. I’m sure it’s a great place to live, but every time I’ve been there I have felt like I was in a Stephen King novel. It’s hard to describe but many others I know have felt the same way when visiting the town. Regardless, we were soon through the town and on our way on Highway 47 north, then onto 202 west. Highway 202 cuts through the northern Oregon coast range and is definitely not a main thoroughfare. It goes through the community of Jewell and its famous elk viewing areas (no elk for us, sadly). The road is narrow and winding and really taxes the rider due to its rough condition. The far west end has seen some repaving but the rest really puts your shocks to work. Riding my V-Strom on 202 is not much of an issue because it can handle the rougher ride, but by the time I went to Astoria and back on my GSX-R750, my back and wrists were starting to complain. Brutus and I gassed up and ate lunch at the Dairy Queen in Astoria before going our separate ways back home. He headed south on 101 to Seaside where he caught Highway 26 for a straight shot east to his home in Beaverton. I backtracked on 202 to where it met rural highway 103 south. I had never been on this road, so I took the turn and followed it to its junction with Highway 26, busy with weekenders heading back to the city from their visit to the coast. 103 was a delight, with great curves, scenery, and road surface. It was all too short, though. Back on Highway 26, I resigned myself to freeway riding for the rest of the trip home. I made it through the city and out onto the east side route on I-84 before getting home 265 miles later. I was exhausted but happy.